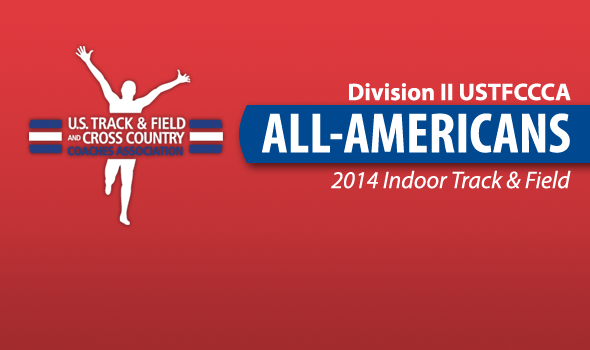 NEW ORLEANS – The U.S. Track & Field and Cross Country Coaches Association (USTFCCCA) has announced the list of Division II student-athletes who earned USTFCCCA All-America honors for the 2014 indoor season based on their performance at this past weekend’s NCAA Division II Indoor Track & Field Championships in Winston-Salem, N.C.
Those student-athletes who finished among the top eight in their individual or relay events earned USTFCCCA All-America honors. USTFCCCA membership by their program is required for the award. Saint Augustine’s men won the team title over pre-meet favorite Adams State by a narrow 1½ point margin, 84½-83, for the closest finish in the history of the meet, and also topped the Grizzlies in terms of total All-Americans, 18-17. The Falcons’ Joshua Edmonds was one of three men in the nation to have earned three All-America honors, while DeJon Wilkinson’s two All-America nods came as the result of individual titles in both the long jump and triple jump. Minnesota State’s Jerrell Hancock and Ashland’s Drew Windle also earned three All-America awards, with Windle claiming national titles both at 800 meters for the second consecutive year and in the distance medley relay. Dual national individual champions Wilkinson and Lamar Hargrove of Tiffin (60/200) headlined 26 men who earned two All-America awards. Adams State led the nation with six multiple-time All-America selections, followed by Saint Augustine’s with five and Ashland with four. While the Adams State men came up just short of a national team title, the Adams State women had their team title wrapped up before the meet finale 4×400 relay even went off. The Grizzlies claimed the team title over Johnson C. Smith, 67-59, but found itself in a three-way tie in terms of total All-America honorees with third-place Lincoln (Mo.) and fourth-place Grand Valley State at 17. Both Kayon Robinson and Chante Roberts posted three All-America performances for the Grizzlies, including national titles at 400 meters for Robinson and in the distance medley relay for Roberts. Alicia Nelson’s two All-America nods for the Grizzlies came in national-title efforts at 3000 meters and as the anchor of the distance medley relay, while national 5000 meter champion Lauren Martin also earned two honors. Adams State had six multiple-time All-American selections, most of any women’s team in the meet. Lincoln (Mo.) had five, while Johnson C. Smith and GVSU both had three. Runner-up Johnson C. Smith had 11 total honors, seven of which came from Samantha Elliott’s (four) and Danielle Williams (three). Williams became the first in meet history to claim three individual titles in the same meet with wins at 60 and 200 meters and in the 60-meter hurdles, while Elliott’s four included a national 4×400 title. Elliott was the meet’s only four-time All-American, while Williams was one of five who earned three awards. Another 24 were twice named All-Americans. The GLIAC topped the total All-Americans by conference list with 51 on the men’s side and 42 on the women’s. The RMAC men were second with 27 over the CIAA’s 24, while the MIAA women edged out the RMAC for second with 30 and 28, respectively.